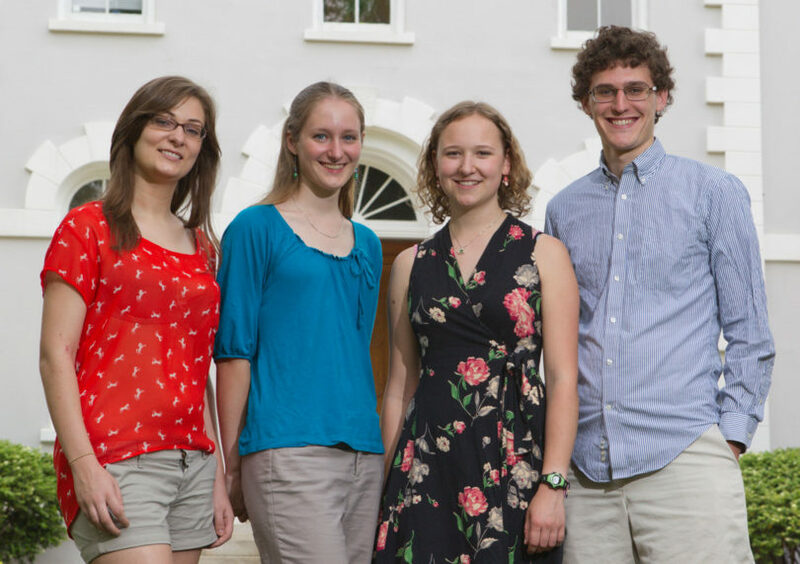 Four UGA undergraduates have been named 2012 Barry M. Goldwater Scholars. They are among 282 recipients of the one- and two-year scholarships that recognize exceptional sophomores and juniors in engineering, mathematics and the natural sciences. The UGA recipients are: Victoria DeLeo, a sophomore from Davie, Fla., who is pursuing bachelor’s degrees in biotechnology and genetics; Marianne Ligon, a sophomore from Clemson, S.C., who is pursuing a bachelor’s degree in cellular biology; Theresa Stratmann, a junior from Irmo, S.C., who is pursuing a bachelor’s degree in ecology; and Waring “Buck” Trible III, a junior from Fredericksburg, Va., who is pursuing bachelor’s degrees in ecology and entomology. The Barry M. Goldwater Scholarship and Excellence in Education Foundation provides a maximum award of $7,500 per year for university expenses such as tuition, fees, books, and room and board. Congress created the program in 1986 to honor the late U.S. senator. DeLeo, also a UGA Ramsey Honors Scholar, has been conducting cereal crop genomic analysis research under crop and social sciences professor Katrien Devos. Ligon, who recently was awarded a UGA Foundation Fellowship, has participated in RNA immunology research in Rebecca and Michael Terns’ biochemistry and molecular biology laboratory as a CURO Honors Scholar and CURO summer fellow. Stratmann, a member of the Honors Program and a 2011 CURO summer fellow, currently is working on her own inquiry developing a species distribution model and related location and surveying techniques for the endangered bog turtle. Her research mentor is vertebrate ecologist John Maerz. Trible, also a UGA Foundation Fellow, has been studying the behavior of invasive South American fire ants found in Georgia with entomology professor Kenneth Ross. Trible also traveled to Costa Rica, carrying out his own self-designed project on the interactions between fire ants and coffee farms.